Born in 1922 to poor working-class Jewish immigrants from Romania, Stanley Martin Lieber got a job in Timely Publications - that would eventually become Marvel Comics - a company owned by a relative. So embarrassed was Lieber by much of what he was writing that he refused to put his real name on the by-line. 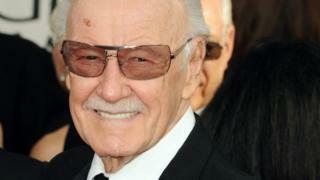 He assumed the "dumb name", Stan Lee, which he later legally adopted. Lee gave each character individual, everyday teenage problems such as dandruff and acne. They would frequently fall out with their parents and each other. The fan letters poured in. Without immediately knowing it, Stan Lee had ushered in the so-called 'silver age' of comics, and his imagination was rekindled. His Marvel universe spawned the new title of Marvel Comics. Radically, Lee gave the artists responsible for the comic designs credits for their work. Jack Kirby, Frank Miller, John Romita and and others achieved cult status in their own right.